Richard Harford, better known as “Slice”, Founder, Owner and Managing Director of Mario’s Pizzeria, is by nature a hard worker. He fully commits to any project that he undertakes and is adamant about seeing it through to a successful end, no matter what the obstacle. His dream was to one day own his very own business, a dream that he has successfully realised. On his return from working in Canada, Richard Harford began to explore the entrepreneurial possibilities within the local business market. After surveying the landscape, Harford decided upon a restaurant with close friend, Richard Gibbon. At about the same the time that the friends began their search for a location, an ice cream shop at the Valpark Shopping Plaza was offered up for sale. The duo grabbed the opportunity and purchased the business as a joint venture. Harford and Gibbon each invested $4,000, going into business as partners of a deli-style restaurant selling sandwiches, roti and drinks. The popularity of the Plaza together with the friendly service and good food served at the deli, led to it being an instant success. Harford was on his way to realising his dream of being a successful entrepreneur. Within months of opening the deli at Valpark, Harford was persuaded to serve pizza instead of sandwiches and roti. Friends of Harford’s – Colin D’Arcy, Vernon Charles & Trevor Acanne – had returned from studies in Canada with a pizza oven in tow. The friends persuaded Harford that a pizza parlour would be a far more lucrative venture than a run-of-the-mill sandwich shop. Pizza had been a staple food of the friends’ diet while on campus and they had become quite proficient at preparing it. 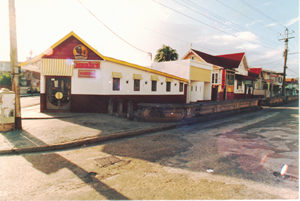 D’Arcy, Charles & Acanne convinced Harford & Gibbon to turn the sandwich shop into Trinidad’s first local Pizza Parlour. The 5 friends banded together to form Mario’s Pizzeria Limited and Harford was appointed the store manager. Ultimately, the first Mario’s Pizzeria opened its doors on June 2nd, 1972 at the Valpark Shopping Plaza, to becoming the first ever Pizza Parlour in Trinidad. The restaurant was a hit. Folks from all areas of Trinidad flocked to sample its fare. Pizza was still new to Trinbagonians but Mario’s earned a high approval rating through the use of cheddar cheese as a primary ingredient. Eschewing the standard Italian mozzarella cheese in favour of cheddar cheese proved to be a big hit and has remained popular to this day. The main key to Mario’s Pizza’s success was Richard Harford’s rigorous work ethic and exacting standards. At 5:00am every morning Harford would go to the market to purchase fresh fruits and vegetables for his daily menu. Upon arrival at the restaurant he would supervise the preparations, making sure every quality control specification was met. Once the doors were opened he would oversee every aspect of the operation. After closing the doors to the restaurant, Harford would balance the cash, do his daily stock evaluation and make the necessary preparations for the next morning. His workday did not end before 11:00pm, but he never failed to get going bright and early each morning without complaint. Eventually, when business slowed down, Gibbon, D’Arcy, Acanne and Charles offered Harford and another mutual friend Victor Pereira the option of buying them out. Harford then became the proud owner of 50% of Mario’s Pizzeria Limited. Pereira would soon sell all of his shares to Harford when Trinidad’s economy started to swing south. Despite the grim outlook, Richard Harford’s determination, and passion for quality products and high standards maintained the popularity and the slow but steady growth of Mario’s Pizzeria. Within recent years, Richard Harford has allowed sons Roger, Ryan and Randal to take greater responsibility for the restaurant chain’s management. Under Assistant General Manager, Roger Harford’s initiative, the Mario’s Pizza Facebook Fan page was launched in 2009 well ahead of local competition. The chain quickly expanded into other popular social networks – Twitter, YouTube and in 2011, Foursquare. Also eager to interact with customers on a more direct, personal level, Mario’s Pizza also offers coupons via email. Mario’s facilitates email subscription on both their website and Facebook Fan page, sending coupons on a monthly basis with each coupon valid for 3 months. Not content to stop there, Mario’s rewards loyal customers with the pleasant surprise of Birthday Greetings & Birthday Coupons. In keeping with its focus on being at the forefront of digital ventures, Mario’s Pizza also offers absolutely free WiFi hotspots at all its locations. From its first restaurant in Valpark, Mario’s Pizza has now emerged as the largest Pizza chain in Trinidad and Tobago, with twenty-two (22) restaurant locations across the twin island state. Keeping an eye focused on continued expansion, Mario’s recently franchised two restaurants in Guyana and St. Vincent, and is currently seeking to do the same in Tobago and continue expansion throughout South Trinidad. It is Mario’s aim to be fully established within the English-speaking Caribbean in the next ten years. Expansion into South America is also under consideration. The lack of a strong regional pizza presence provides rich opportunity for Mario’s to become as synonymous with pizza in South America as it is in Trinidad. To provide a great taste and an enjoyable experience. To be the market leader in the quick service restaurant industry in our chosen territories. We believe that respect for our customers, our suppliers, our colleagues and ourselves is the key to enduring and trusting relationships. We believe that a bias for action and personal accountability for results provides the foundation for teamwork, personal commitment, self-motivation, and ultimately, superior business performance. We believe treating our employees like family makes work more fun and is rewarded with loyalty. We believe that total customer satisfaction, driven by our obsession with service excellence, provides the pathway to sustainable profitability. We believe our pursuit of the highest standards in health and safety demonstrates caring for our employees, delivers value to our customers and enhances our brand. Mario’s Pizzeria has made a decision to franchise regionally, up through the Caribbean Islands. We are focused on building our brand to become a major regional player in the Quick Service Restaurant industry. Mario’s was founded in June 1972 and currently is the market leader in the pizza industry in Trinidad and Tobago in terms of number of restaurants, market share and volume per restaurant. With your help we can continue to grow the Mario’s brand and expand regionally into the Caribbean and eventually the rest of the world. If you are interested in joining the Mario’s Family, please email us at franchise[at]mymarios.com for more information.